So there is a wonderful new arrival coming to your loving home, however, space has been tight already and how are you going to fit in even more furniture. Well, hopefully you have taken some of our advice in previous articles on how to make the most of limited space in small homes. When it comes to expanding families living in small homes, it is important to find the right furniture to suit the size of your place. 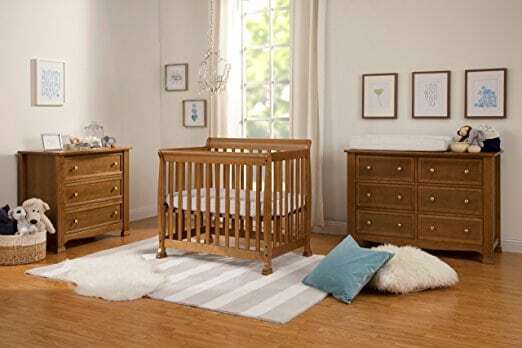 In this article, the best mini baby cribs for small spaces, we will be choosing some of our favorite small baby cribs that will not only be perfect for your little one but also a perfect fit for your small home. This cute little mini crib by DaVinci will be an ideal choice for newborns moving into a small nursery. It has a number of features that make it our favorite crib. Four adjustable mattress positions make it easier on you to look after baby from weeks to months old. It is not easy to bend over all the time taking care of a newborn, therefore a higher mattress position is easier on your back. As baby grows and starts to become more mobile, you can lower the mattress position, making the crib a safer place for baby to move around in. The small baby crib also comes with removable wheels for ease of movement. If you want to move the crib from room to room, then these wheels are ideal. When you want the crib to be static, then the locking wheels can be set in place for added safety. These wheels can also be removed, allowing the rocking feature to be used. The rocking feature is a real added bonus and will really help you get baby relaxed and sleepy. This mini crib is ideal for small nurseries and with dimensions of 38.8″ x 26″ x 35.2″, it is perfect for fitting through standard doorways and moving from room to room. This small crib meets ASTM international and U.S. CPSC safety standards and is non-toxic , lead and phthalate safe. The mini crib may be small in size, however it is solidly built with a sturdy structure and uses strong slats. If you are looking for a mobile, mini rocker crib for a small nursery, then we highly recommend this mini crib by DaVinci. We really like this baby crib, not only because it looks great and is a lovely space saver for small places but also because it is great for moving around. Just because parents have a new baby, doesn’t mean they stop travelling around. This compact baby crib by Delta is not only small when fully assembled but can also be taken apart, down to a width of only 6″. This is great for when you are on the move but also perfect for when baby has sleepovers at grandparent’s home. The baby crib comes with wheels allowing you to freely move it from room to room and fits through standard doorways. It takes up 35% less space than a standard crib making this a great space saving crib for small apartments. When disassembled the crib can be stored away in a closet or under a bed. It has a two position mattress support that allows you to change the position for when you are changing baby or for when baby is sleeping. The crib is lightweight, sturdy and solid and also meets or exceeds all JPMA and ASTM safety standards and contains no lead. If you are looking for a small, mobile and portable mini crib for your small home, then have a look at this space saving crib by Delta. 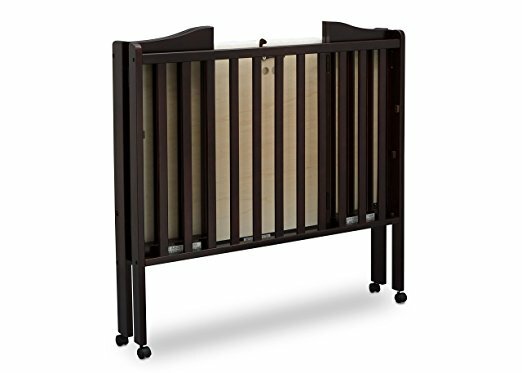 If you are looking for an attractive, strong and sturdy mini crib that takes up a small space, then the Kalani 2-in-1 crib by DaVinci could be the one for you. Parents love the small footprint this crib makes and is ideal for parents that want to share the same room with their little one. The crib has two mattress positions depending on where you want baby to be at that given time. The crib comes with a 1″ mattress pad but this will not be enough for baby’s comfort. Most baby crib’s come with this size mattress, however is is just a pad and a thicker mattress will need to be purchased separately. A feature that is different to the other cribs we reviewed is that the crib can convert into a twin size bed when your little one is older. A conversion kit will be sold separately, if you are interested in this feature. We really like the look of this crib and it certainly is an attractive one. It doesn’t come with wheels so will have to be carried from room to room. If you do not expect to move your crib around the house then this shouldn’t be an issue. This sturdy little crib meets ASTM international and U.S. CPSC safety standards and is non-toxic , lead and phthalate safe. If you are looking for a space saving, strong and sturdy baby crib to fit into your small home, then check out this mini crib for small rooms by DaVinci. Not exactly a crib but similar and for babies up to 6 months. 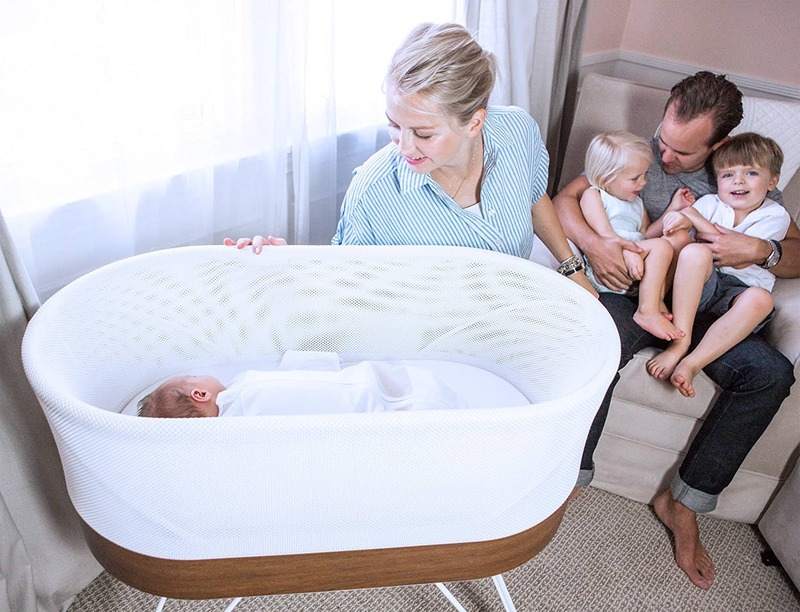 The Snoo Smart Sleeper by Happy Baby is a small crib with the unusual feature of distributing white noise to your baby while the little one is in the crib. The Snoo imitates the noise and feeling the baby would have had in the womb and therefore puts baby in complete relax mode. Of course, the benefit of this deep relaxation is better sleep for baby and less stress for mom. Snoo weighs 38 lbs and measures 30″ x 16″ x 32″, making it suitable for small spaces. The Snoo Smart Sleeper is small in size because it is suitable for small babies up to 6 months, preparing them for sleeping in a crib. If your baby is finding it hard to sleep, then the Snoo could be the answer you are looking for. Trying to fit new baby furniture into a small living space can make a small home feel even more cramped. Finding baby furniture that has the smallest footprint is the key to solving this problem. 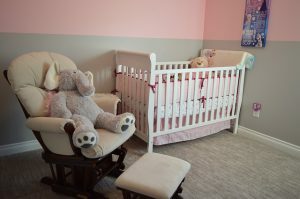 Many baby cribs are over-sized and too big for the baby. Mini cribs for young babies are an ideal way to take up less space but still have plenty of room for the little one to sleep comfortably inside. With great features like mobility and portability, these small cribs are more useful than the larger ones, especially in small spaces. We hope you found the best mini baby cribs for small spaces useful and found your perfect little crib for your new arrival.